Two-fifths (38%) of UK, US and Brazilian consumers mistakenly think MasterCard is a World Cup sponsor, with rival credit card brands Visa scoring just 4% higher recognition at 42%, according to research from GlobalWebIndex. Other brands not officially linked to the tournament but which scored high recognition as "sponsors", included Carlsberg in the UK. Budweiser is the official World Cup beer sponsor. Non-sponsor Pepsi, which has been running football-themed advertising, scored the highest awareness as a World Cup "sponsor" among US consumers. Nike, which last week launched a humorous five-minute animated epic, was selected as a sponsor by nearly a third of UK and US consumers. Meanwhile, a fifth of UK consumers also thought that Samsung is a FIFA sponsor. MasterCard has not sponsored the World Cup since 2006, when it discontinued its 16-year association with the tournament. On a more positive note for those brands forking out millions of pounds on sponsorship of the Brazil World Cup, Coca-Cola, a sponsor since 1978, and Adidas, a sponsor since 1970, gained the highest recognition as World Cup commercial partners. Coke’s association proved the most resonant for consumers, with two-thirds of UK and US consumers selecting the brand. 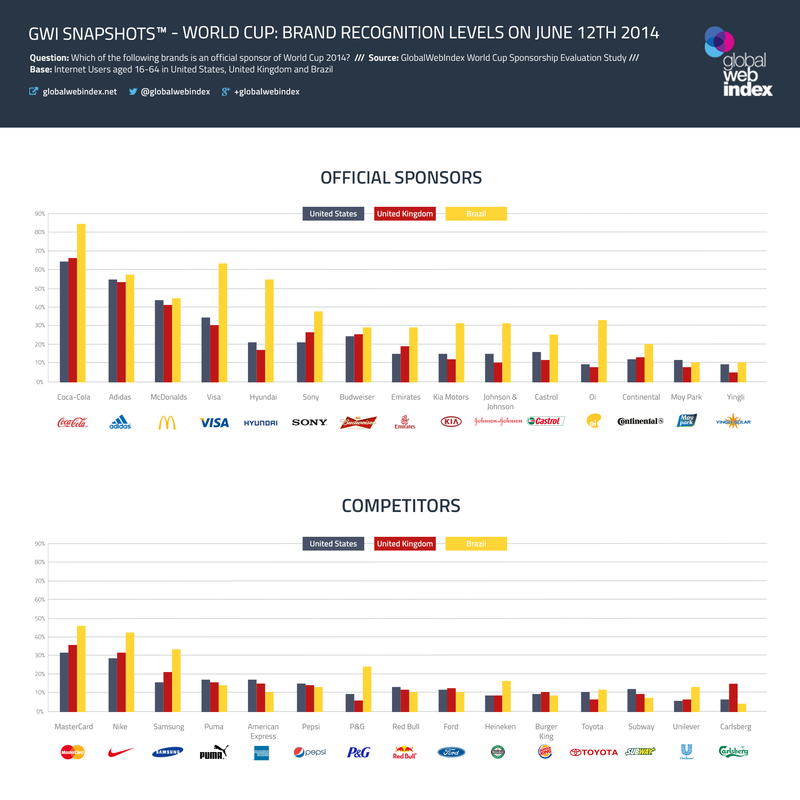 Overall World Cup sponsor recognition levels were at their highest to date, particularly in the host nation, according to GlobalWebIndex. The research project involved the firm asking members of its real-time panels in the UK, US and Brazil to identify sponsors. Respondents were asked to pick official World Cup sponsors from a list of 38 brands, both official sponsors and their non-sponsor rivals. The research also examined respondents' media consumption, and found that 91% of real-time fans second-screen while watching TV, with mobiles the most popular device. Other findings were that 87% of UK Twitter users will be watching the World Cup live on TV, with a sixth of them saying they have previously retweeted football-related content from brands. Meanwhile, it has emerged that non-sponsor brands on-site at World Cup venues in Brazil are being taped over by Fifa, a move similar to over-zealous brand policing at the London 2012 Olympic Games.